If you would like a signed copy or specific dedication please add the details in the box provided. NOTE: Standard p&p for UK ONLY is £3.00. For other regions, please select your delivery zone from the dropdown list. £3.00 will be added to each of the prices shown. - Why the womb energy centre is critical to the well-being and happiness of all women, whatever their age or physical condition. 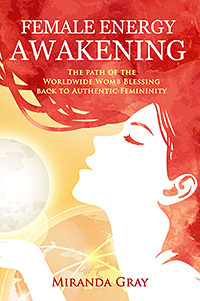 - How the Sacred Feminine is relevant to modern women, and how reconnecting to this principle can lead you to a less stressful life. - How to fully embrace your femininity in a masculine-centred world that constantly disconnects women from what it means to be truly female. Red Moon introduces you to the four phases of the menstrual cycle through images from myth and legend and then, with the help of the ‘Moon Dial’, guides you to discovering the unique energies which lie in your own cycle. Understanding our individual cycles and expressing the creative/sexual/spiritual energies as they arise in the form they naturally take brings the freedom to realise our full potential. £9.99 + p&p if ordered from this website. For the modern woman who wants to create success and achievement in her work life, projects and goals, and to create personal fulfilment and well-being, in a uniquely female manner. SPECIAL OFFER! Buy direct and save £2.00 on the cover price! Just £9.99 + p&p if ordered from this website. Feminine wisdom for the menstrual cycle. A book that returns to us the secret of living a female spiritual life in a masculine world. Small enough to fit in a handbag for daily support and wisdom and with beautiful colour illustrations by Czech artist Lenka Blažejová, to divide the phase sections. En este libro, Miranda Gray comparte con sus lectoras cómo se gestó esta Bendición y proporciona respuestas a cuestiones tan esenciales para la mujer moderna. 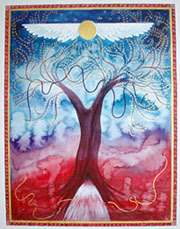 Hay una vía espiritual secreta que es solo para mujeres, y la clave de nuestra conexión y relación con la Divinidad es precisamente el ciclo menstrual. En cada fase de nuestro ciclo cambia nuestra relación con la Divinidad, nuestras necesidades espirituales y la forma en que encarnamos o expresamos la espiritualidad. La autora de Luna Roja reúne aquí una sabia colección de mensajes organizados en cuatro niveles de conciencia, relacionados cada uno de ellos a las cuatro fases del ciclo menstrual. Los mensajes están diseñados como inspiraciones diarias para apoyar y sostener día a día tu conexión espiritual femenina. If you are interested in publishing 'Spiritual Messages', 'Red Moon' or 'The Optimized Woman' in different languages, please contact miranda.gray@footmark.com.